Welcome to this guest post providing an itinerary and ideas for how to spend 5 days in Barcelona! There are a number of destinations that I have been to a few times and feel like I know them quite well, and yet I've not written much about them on this blog. That's partly because I wasn't writing city guides or travel itineraries back then, and that's a huge shame because there were a lot of fantastic destinations. Destinations like Barcelona. Fast forward six years and I feel my knowledge is a little out of date so it's too late to write an in-depth Barcelona itinerary. So what do I do when I still want to offer you a great city guide for Barcelona? Well, I accept the very kind offer of Naomi from Probe around the Globe. who is something of a Barcelona expert, to publish a post all about what to see and do during five days in Barcelona. Personally, I feel like five days in Barcelona is the perfect amount of time to see A LOT of the city and to really feel like you've got to know many of its different areas and facets, not to mention some of its unique landmarks and sights. Best of all five days in Barcelona should also be enough time to include at least one afternoon on the city's beaches, which really are RIGHT THERE, like, just THERE for you to go soak up some sunshine on. But enough of me prattling on about my chosen things to do in Barcelona, instead let me hand you over to Naomi who knows the city much better than me as her fantastic 5-day Barcelona itinerary will prove! Wow, lucky you! You have 5 days in Barcelona and you wonder what to do in this vibrant, unique Spanish city? You’ve made a good choice, because Barcelona is packed with amazing sights and one of a kind experiences. Follow this balanced Barcelona 5-day itinerary full with practical tips to make sure you’ll see the best of Barcelona in five days! So, this is your first time visiting Barcelona and you’re set to explore the city? I assume you want to see the absolute highlights as well as take in the unique atmosphere of Barcelona that you’ll not find anywhere else. Luckily, you have enough time in Barcelona so you can enjoy a balanced itinerary and not feel overwhelmed and exhausted by all the sights. I'll walk you through my perfect five day itinerary and include tips on how to get there and where to stay. If you’re a first time traveller to Barcelona, my ultimate tip would be to take things slow and not hit all the major sights in one day. It would be overwhelming and after all, you have five whole days in Barcelona, which is more than enough time. That said, I know it is hard to ignore the vibrant colors and one of a kind architecture of Barcelona on your first day. So I’m offering you highlights and some relaxed things to do to get to know the city on your first day. Synonymous with the city, Gaudi was a very busy architect and Barcelona was his playground. Of course you’ve heard about his still unfinished masterpiece, the Sagrada Familia, but there are many other houses and buildings in Barcelona that Gaudi designed, and maybe there is park you might have heard of? Well, we are not going to do all of that on your first day as that would be overwhelm. Instead, you can pick and choose from the following Gaudi highlights to have a balanced sightseeing day and still not miss a thing. On the Passeig de Gràcia, almost opposite of each other, you’ll find two of the most famous Gaudi houses in Barcelona. Unfortunately, they are also some of the most popular tourist attractions of the city so seeing them can be a crowded and chaotic experience. My suggestion for the first of your five days in Barcelona, therefore, would be to just pick one to visit. Casa Mila is also called Casa La Pedrera and it's a remarkable and unique building that isn't easy to forget. You can visit the different courtyard, see the museum and roam through the rooms which are decorated with modernist furniture. The roof offers amazing views of Barcelona and funny, man-like chimneys. To avoid losing time and getting frustrated, buy your skip-the-line-ticket in advance here, and it includes a free audio tour. Casa Batllo is the pastel colored building with lovely balconies on the facade. On the interior, you’ll submerge in an underwater world. Full of reference to marine life and the element water, you’ll climb the steps of the house to ultimately end up on the dragon spine decorated roof top. Easily save yourself at least an hour of waiting in line, with these skip-the-line-tickets, or you can treat yourself to these special silver tickets which are also skip-the-queue tickets that also include access to private areas. If you suffer from FOMO like I do, you can visit the other house on another day in your Barcelona itinerary later. Getting there: Metro stop Passeig de Gracia is the best access point to visit either Casa Batllo or Casa La Pedrera. Another must see Gaudi sight in Barcelona, is the Parc Güell. Situated in the North of Barcelona, this hill offers great views of the city. A public park since 1926 you can visit Parc Güell for free. You can roam around, take numerous selfies with blossoming flowers and play hide and seek under the arches and domes of the park. However for a visit to the monumental zone inside the park, you need a ticket. The tickets work with a time slot and this ensures only a fixed number of people are at the smaller area at the same time - a good thing, trust me as the rest of the park may feel quite crowded, unless you arrive early in the morning. Inside the monumental zone you’ll find the large plateau with the colorful snake-like benches with the superb view of Barcelona. Underneath the overhanging plateau, you’ll find a forest of columns representing nature and the with mosaics bedazzled staircase with colorful stone creatures. Save time and buy your allocated time slot ticket to the Parc Güell online here. Alternatively, you can go on a guided walking tour of the park, and you may also want to consider a visit inside the Gaudi House Museum which is also located in Parc Güell, again buying your tickets in advance online will mean you skip all the queues and save your time for doing what you want to do. Getting there: It's worth knowing that Parc Güell doesn’t have a convenient transport stop in front of the entrance. All options to get there (apart from taxi or car) involve a small portion of walking (up hill) so if this is a problem you should think about your travel plans. To get there with public transport, take the L3 Metro (green) to either stop Lesseps or Vallcarca. From there, calculate 20 minutes walking. You can also go to the Alfons X metro stop on L4 (yellow) where you can take a free shuttle bus to Parc Güell (10 min). Busses H6 and D40, and the Barcelona Bus Turistic stop at 10 minutes walking distance from the park. Wow, you’ve only been in Barcelona for a day, and you’ve already visited two Gaudi masterpieces and two of the most iconic sights of Barcelona! That has almost certainly left you feeling a bit hungry, so now it is time to eat some food, all the while, exploring and learning about Barcelona’s history and culture. There are lots of different food tours to choose from, including self-guided walking tours, cooking classes and market tours, group tours, private food tours and even a secret food tour. I recommend you do an evening food tour. This will help you during your next few days in Barcelona as you’ll learn the difference between tapas and pintxos. You’ll learn how to order food in Barcelona and get valuable tips for the remainder of your stay. Get those taste buds tingling with some of the most delicious foods of Barcelona on your food tour. Find the best food tour for you and your travelling companions here. Today is the day! I know you can’t wait any longer, so let’s tick the Sagrada Familia off your Barcelona bucket list. In the morning, it is finally time to visit La Sagrada Familia. The church is still under construction and will need a couple more years to finish. However, this doesn’t really obstruct your visit as the main church is finished and you can bask in the colorful light of the stained glass windows. There are several different tickets available, the most basic one let you walk around the church without any extra options. You can upgrade with an audio-guide, or with an extra ticket to climb one or more of the towers or explore with a tour guide. The Sagrada Familia is enormous and is the only tourist attraction (to my knowledge) that receives millions of visitors but has not finished being built yet. This fact alone makes for intriguing anecdotes and remarkable information about the building process, hidden architectural features, and the need to get a guide. The bare minimum would be an audio guide. You can book a private guide online in advance to save you time on the day and for the most special experience of all, be sure to get tickets to a tour that includes tower access. Make sure to take in each facade from the parks opposite the church. To relax a bit after such an overwhelming experience and to absorb the Sagrada Familia in your mind. Getting there: The Sagrada Familia has its own metro station. It serves the lines L2 and L5. After the Sagrada Familia, I recommend a visit to the nearby Hospital Sant Pau. Also built in modernist architecture style, but without the massive crowds and waiting lines. The Sant Pau Hospital is one of Barcelona’s modernist buildings, not made by Gaudi but it's equally impressive. This former hospital served as a sanctuary of light, a beacon of modernist building style, and a safe haven in a turbulent city. Today you can visit the separate buildings of the hospital, learn from the exhibitions and unwind in a courtyard filled with orange trees. After the group-tour craziness of the Sagrada Familia, this is a pleasant retrait to balance your sightseeing in Barcelona. Curious about the Sant Pau hospital, buy your tickets here or get a special guided tour here for not much more money. In my personal opinion, a city is best explored on foot. Walking around the center of Barcelona will show you the beauty and splendor of the city while taking in the sounds and smells of Catalunya. You could join a guided walking tour, or explore on your own. In the afternoon, we focus on the Gotic area of downtown Barcelona. This area with her narrow streets and dark alleys is the oldest part of Barcelona. It dates back to the Romans but you’ll see mostly medieval and 19th and 20th century buildings. Closed for traffic, the best, and only way, to explore this part of the city is on foot. Guaranteed you’ll get lost but that is part of the fun. In the end, you’ll always find one of the major landmarks of the district. Pick metro strop Liceu (L3-green) or Jaume I (L4-yellow) to explore this area of Barcelona. Although the Sagrada Familia has become the iconic church of the city, it is actually the Cathedral of Barcelona that is the main church for Catholics. Even if you’re not religious, a visit to the facade and a walk around it is a must-do in Barcelona. In the square in front of the cathedral it is always buzzing’ with people and street performers. Walk around it and admire the delicate archway bridge and hidden courtyards. If you do visit the interior, know that for an additional €3 you can climb to the roof of the cathedral of sweeping views of the neighborhood. Just outside the Gothic quarter, you’ll find this modernist temple of music. It is an exciting building from the outside with her red brick structure and exuberant details. You can take a tour of the interior where you’ll find a plethora of mosaics, the colorful glass-stained dome and one of the biggest stages in town. Book a tour of the Palau de la Musica here or, even better, find tickets to Flamenco performances at the Palau. Not far from here, you’ll find the lovely Parc de la Ciudad with her gigantic red arch. Slowly meander through the lush green pavilions, trickling pounds, and old men of Barcelona playing petanque. The park is perfect for a late afternoon nap, sunbathe, or bring your own picnic for a dinner at the park. Looking for tips on Barcelona nightlife? Find the ultimate Barcelona nightlife guide here. Day 3: A mid-week rest day! We’re not even halfway through your 5 days in Barcelona, and we’ve already seen so much! We use this day to take things a little easier but still see exciting Barcelona. After two days of sightseeing, you’ve seen quite a big portion of the city. You’ve walked around, seen impressive buildings and got an idea of what you like or don’t like. Maybe today is the day to sleep in a little, go to the beach or take that 5-hour long tapas lunch with drinks that last the whole day. Reminder that on day one of this five-day itinerary I only advised you to pick one of the Gaudi houses to visit? Which one did you pick? La Pedrera or Casa Batllo? Today you could visit the other one. Or visit one of Gaudí’s first modernista house, Palau Güell. If you find yourself at the Passeig de Gracia again to visit one of the Gaudi houses, I suggest you to walk north into the Gràcia neighborhood. Although it doesn’t have world-class famous attractions, it does offer an abundance of sunny squares, buildings adorned with modernist features, and a whole lot of Barcelona-charm. All for you to take in, for free! Highlights would the Casa Vicens and the Casa de las Punxes. Ice cream at the Vila de la Gràcia square with the bell tower is a must. In the evening, go see the light and water spectacle at the Font Magica, the Magic Fountain. Almost each night, the fountain and the MNAC are the star players in a show that involves light, music and a lot of spouting fountains. Use the Placa d’Espanya as your metro hub. Getting there: Head to metro stop Diagonal (Blue or Green) to explore this neighborhood of Barcelona. Who says you have to stay in the city every day of your 5 days in Barcelona? Catalunya is a varied region and Barcelona is a perfect base for one or more day trips. I loved our Costa Brava trip, but when you want to mix your time in Barcelona up with some lovely nature, then a day trip to Montserrat, is my top-recommendation! You’ll find the Montserrat mountains and monastery an hour outside of Barcelona. You’ll take a train and cable cart up the mountains and get to explore a whole day in nature. Take in the sweeping vista, the oddly shaped mountain peaks and unwind from traffic-heavy Barcelona. Read my elaborate guide for your day trip to Montserrat by train here or you can book a day trip tour that includes pick-up in and return to Barcelona. Pack your bags and savor your final breakfast, because today is your final day in Barcelona. I hope you don’t have to leave at the crack of dawn, so you still have some time to enjoy Barcelona in a relaxed way. Barcelona can be overwhelming with broad lanes of traffic, hordes of tourists and long waiting lines. I’m not saying they don’t exist at Montjuïc, but this hill hugging the south of Barcelona is a lot less crowded. Take the cable tram up and explore on foot. Visit the different sites of the 1992 Olympic Games, like the sports complex and the Olympic Stadium. Cross the Botanic Gardens and end up at the MNAC (Museu Nacional d'Art de Catalunya) to gasp of the widespread view of Barcelona. From here, you can descend the staircases and play with the water fountains until you reach the Plaça de Espanya or take the cable car down to the harbor. Getting there: You can reach Montjuïc via metro stop Parallel (L2 purple and L3 Green) where you can take the funicular up the hill. Do you still have some time left, and want to give your feet some rest after walking around for 5 days? Then a bike tour is perfect for you! There are numerous bike rental shops in the city, but the most fun I had, was biking along the beach and Barceloneta area. You can join a bike tour and explore this part of Barcelona, soak up the sun and the waterfront of the city. Find a highly-related Barcelona Bike Tour here. How to get around Barcelona in 5 days? Although our 5-day itinerary for Barcelona involves a lot of walking, I think it is an economic decision to purchase some sort of public transport card as you’ll want to cover the whole city and simple cannot walk it all every day. Luckily, for you, Barcelona has a wide variety of transport options and tourist cards to make the most of your time in Barcelona. Barcelona has three airports that you can use. The two smaller ones, Reus in the south and Girona to the north are located over an hour away from Barcelona so keep this in mind if you are flying there. They usually cater to the low-cost budget airlines in Europe and you’ll need expensive bus services to the city. Most likely, you’ll fly into El-Prat Barcelona airport. The best way to find your flight to Barcelona is via Skyscanner. From the airport, you can easily take a taxi, train, metro or bus to the city center. Read all about my budget hack for transport from the airport to Barcelona center. Barcelona is equipped with an elaborate network of metro stops. Zoom underground in no-time to the Sagrada Familia or Parc Güell and back! As always, be aware of pickpockets in the subways. Another thing to think about is the different distances you need to cover when using the metro in Barcelona. Changing lines can involve a 10 minute underground walk and not all tourist attractions have a metro stop at their doorstep (I’m looking at you dear Parc Güell). Check the Barcelona Metro map here. For some routes, buses can be a good solution for your Barcelona 5-day trip. But local buses can be daunting and you never know if you missed a stop or not. Barcelona has several tourist buses, that DO stop at all the major tourist spots in the city. I recommend the Barcelona Turistic bus, which has 3 different routes that even cover the further suburbs of the city! Just hop on and hop off at will. The bus included audio guidance in over 23 languages! Read my review of the Barcelona Tourist Bus here. Another great money saver is the T10 pack. Basically, you buy 10 transport tickets on one card. It doesn’t have an end date and it is not personal, so you can use it with multiple people until the 10 trips are finished. The card covers all local buses and the subway (some exemptions) and the local trains in Zone 1. At little over €10 for one T10 card, one ride will be €1. Perfect for a couple of trips during your 5 days in Barcelona. If you think you’ll use the public transport system more than 10 times during your time in Barcelona, a Hola travel card might be an option. They offer unlimited transport during the duration of the card. The Hola pass comes in 2, 3, 4 or 5 day travel card for Barcelona. Forget walking and hop on a bus or metro and zip from one end of the city to the next. TOP TIP: Make sure to buy your HOLA Barcelona 5 day travel card in advance here, so you can use it from the airport. Where to stay in Barcelona for 5 days? Eco Boutique Hostal Grau. Just of the Ramblas, this boutique hotel is snugg, conveniently located in the center of Barcelona near metro stops, and value for money. Plus they recycle everything, offer free coffee and cake, and have the most comfortable beds I found in Barcelona! Hostal Grau is a great place to stay if you want value for money, atmosphere and eco-friendly credentials. W Barcelona - Frankie: My first time in Barcelona was actually a work trip and I was hosted in W Hotel, which had just opened. This striking structure is difficult to miss at the end of Barceloneta beach and it's well worth heading there to feel like you're on more of a beach holiday than a city break. The rooms are amazing with tons of space, incredible views and lots of little luxuries and stylish features to enjoy. I would definitely be keen to stay at the W Barcelona again if we were ever to go back to Barcelona! Hotel Miramar - Frankie: My second time in Barcelona was with my partner and we had been travelling for around five months non-stop and had just come from staying on a friend's floor for a few weeks so we decided to treat ourselves and splash out a little on a nice luxury hotel. Hotel Miramar was exactly what we wanted and need. Set on the hillside of Parc Montjuïc we felt a million miles away from the hustle and bustle of Barcelona, although in reality we could get down to the beach or the city centre in less than fifteen minutes by walking or getting the cable car down. The pool area was the perfect place to relax after a busy day sight-seeing, and in fact I seem to recall we sacked off exploring one day just to lie by the pool and read and rest! Airbnb: You may also want to consider staying in an Airbnb to take advantage of cheaper rates for a longer stay, and the option to cook for yourselves and have lots of space to relax and rest when you're not exploring Barcelona. Due to overtourism, the local laws on Airbnbs have become stricter so places aren't as easily available to find, nor are they as cheap as they used to be, but there are still some great options to be found if you do a little research. On your first visit to the city, you want to explore as much of Barcelona as possible. I hope you’ve found my itinerary for Barcelona balanced, but full with practical tips on what to do in Barcelona for five days so you’ll have a wonderful time. How many days do you have to explore Barcelona? Have you planned out your Barcelona itinerary yet? What is your must-see in the city? Let me know in the comment section below, I’d love to read your thoughts. 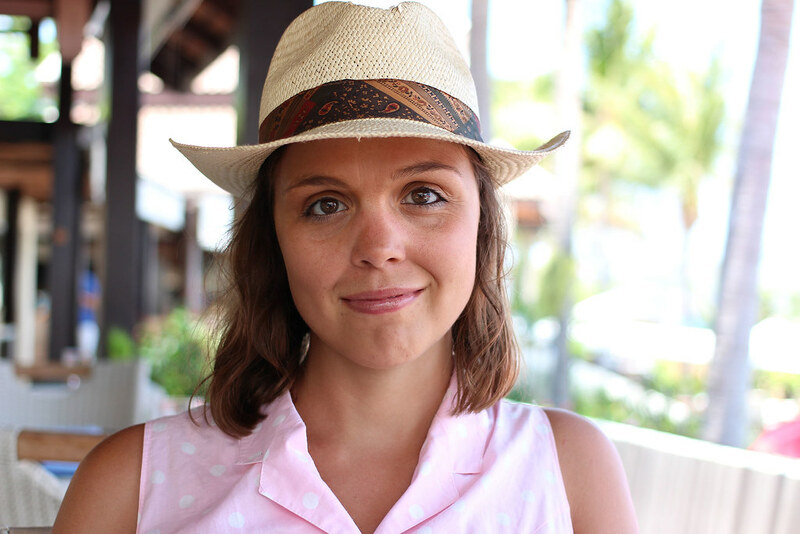 Naomi is a travel blogger from the Netherlands. She is a train travel enthusiast, cheese lover and history geek in one. On several trips to Barcelona, Naomi explored Barcelona inside and out so go to know the city very well. You can read all her Barcelona adventures here and find Naomi on Instagram and Facebook.